It is a bright sunny day. A perfect day to go outside and enjoy your pool. The following question to ask is "What is the temperature of the pool?" 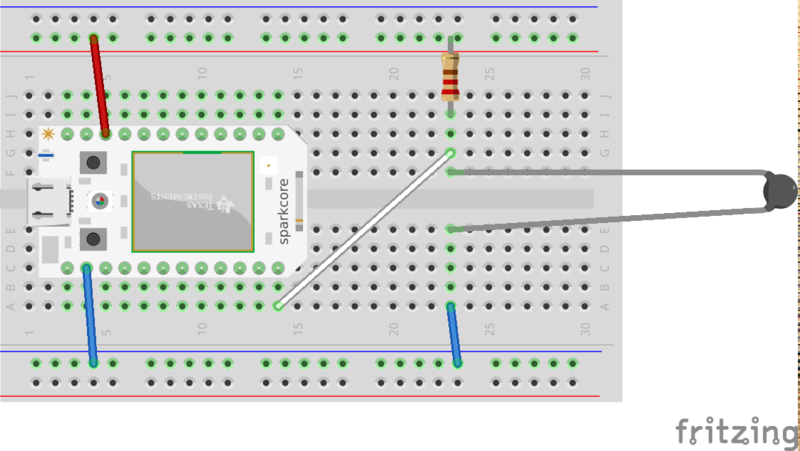 Using simple hardware, combined with apps on your cellular device, a wifi connected pool temperature monitor was created to answer that question in seconds. A thermistor was used to sense the temperature of the pool. This was connected in a circuit with a Photon Particle. This device then sent the temperature data to a cellular device at the request of the operator. In order to read the temperature, two apps must be used in combination. A DO button calls the function in the Photon Particle which in turn publishes the current temperature. Then the IF recipe created will trigger once the Particle publishes the current temperature and will send a notification the cellular device. Once the DO button is pressed, a notification of the water monitor will be sent to the cellular device. // Convert Celcius to Fahrenheit - EXPERIMENTAL, so let me know if it works please - Gustavo.